Replica of a mug presented to all children born in Derby on the 13th January 1913 to Commemorate the National Insurance Act. According to an article which appeared in the Derby Evening Telegraph on Wednesday 12th January 1938, only about a dozen original mugs were made "and the replicas which Sir Thomas Roe gave to a few of his friends meant that not more than 30 were produced"...."to qualify for one of them.....each baby had to survive the perils of the first month of life - the most critical period of all." I have included it here as I suspect that it was made some time after 1913, but further research is required. Alton shape tray in the 1128 pattern produced to celebrate the Centenary of the (Masonic) Commercial Lodge no 411 in 1932. The date cipher clearly shows the "dot" to the left of the arrow. Plate from a dinner service with the Johnston(e) family crest dated 1934. 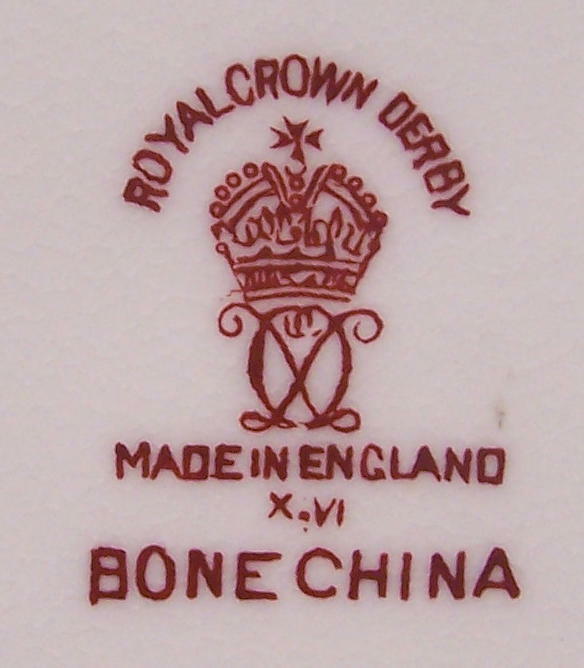 The motto in latin "Nunquam Non Paratus" means "Never Unprepared"
Part of a service commissioned from Royal Crown Derby in 1938/9 by Edward James, for his Surrealist house Monkton. It was designed by Salvadore Dali who had stayed with Edward James in his London home in 1936. The service was sold as part of the Edward James Collection at Christies in 1986 and was bought by the dealer John Jesse. 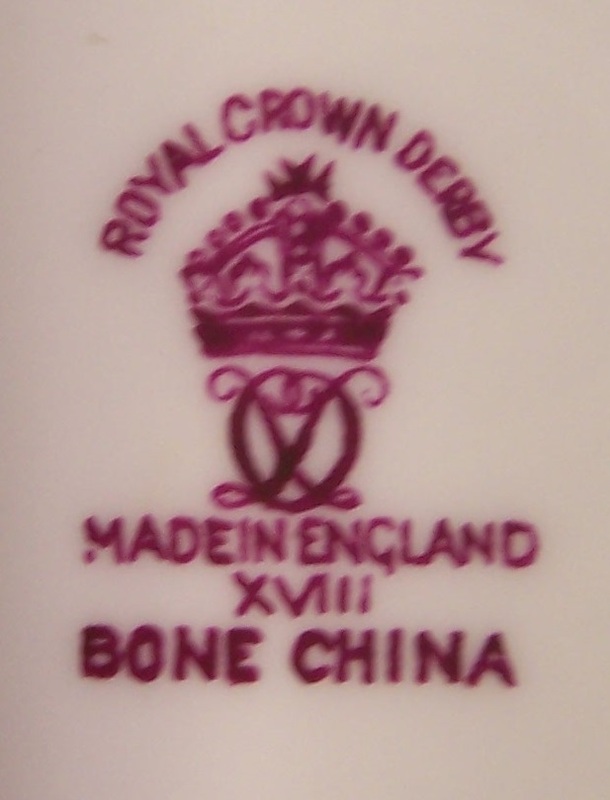 Subsequently, pieces have been acquired by the Victoria & Albert and Royal Crown Derby Museums. The plate is in the collection of the V & A Museum and the image is © Victoria and Albert Museum, London. The image of the Jug is by courtesy of Bamfords Auctioneers and Valuers. Salvadore Dali had co-operated with Fashion Designer Elsa Schiaparelli, who had pioneered the use of hands in fashion. In her 1934 collection she had included belts made from hands, a handbag with hand fasteners and a jacket decorated with a hand motif. (See http://www.anothermag.com/fashion-beauty/7233/hands-in-fashion). The gloved hand motif would therefore have been very fashionable at the time. Talbot shape plate with Corporation of Derby centre dated 1939. A blue enamel version of pattern 9736. Perhaps this was a trial piece for the dinner service eventually designed for the corporation by Phillip Robinson in 1945 (See below), but further research is required. Oval dish shape 1685 with view of Chatsworth House by Dean. It is inscribed in gilt on the rear "Chatsworth Lodge No 3430 1939-40" with factory mark for 1940. In a report appearing in "Freemasonry Today" of the 14th March 2012 Chatsworth Lodge No 3430 was included in a list of those which were recommended for "erasure" being no longer viable. The image is courtesy of Bamfords Auctioneers and Valuers. Cigarette Box with the crest for Eton College dated 1940. Tea Cup Tall in the Elizabeth shape with a red enamel version of the "Diana" pattern and dated 1953. I would be very interested to know more information about the crest. The motto Nosce Te Ipsum ("Know Thyself") does seem to have been quite widely adopted. A gadroon shape tray commissioned by Ockbrook School in 1953 to celebrate the Coronation. Ockbrook School was founded by the Moravian Church in 1799. A series of pieces made for City of London Livery Companies in 1953 to celebrate the Coronation. The Companies with mottos are as follows from left to right:- Mercers, "Honor Deo", Blacksmiths, "By Hammer and Hand all Artists do Stand", Armourers and Brasiers "Make all Sure" and finally the Grocers footed oval tray "God Grant Grace". I have also seen and purchased a crescent dish for the Sadlers "Hold Fast Sit Sure", but it apparently was "lost in the post". The coffee cup shapes from left to right are Ely, Edinburgh and Dublin. 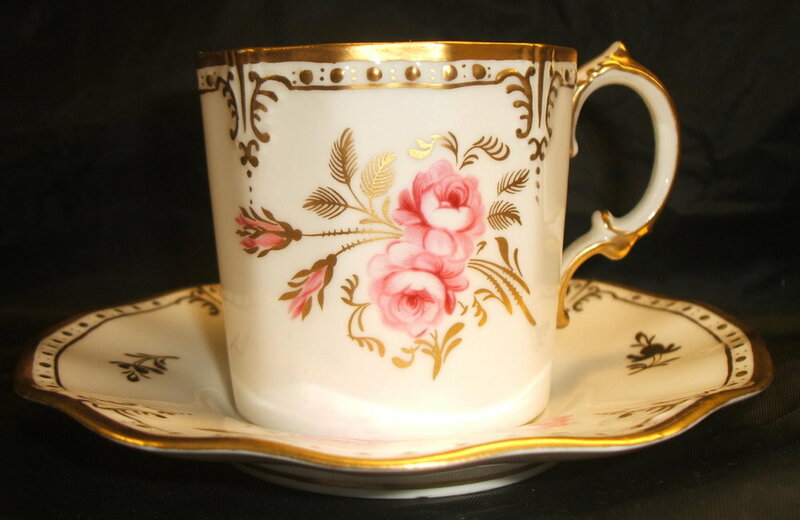 The Mercers' coffee cups were sold in boxes of six, and in total 2,500 pieces were made. The Armourers' gadroon shape cigarette box and tray were given as a boxed smokers set to the 100 members. The Grocers' oval tray is in pattern A1043 and 230 were produced. Part of a Dinner service for two hundred persons designed by Phillip Robinson which was reported in the Derby Evening Telegraph of the 4th April 1945 to be in production to be presented as a gift to the Corporation of Derby by the Board of Directors of the "Telegraph" to commemorate the year in office as Mayor of Councillor W.I. Phillips who, at the time, was director and manager of the Paper. A token presentation was made at the time, but because of the then government ban on production for the home market, the service was not completed until 1954. The first pattern is not recognised and only seems to appear on this service. The second is "Vine" with a Celadon rim (A774/A838). Cup and plate with unknown crest dated 1954 and 1959. I have seen a coffee cup with the same crest. I have been unsuccessful in finding out any information regarding the crest so if anyone can help please get in touch via the contact page. Trays in the 2451 and Posie pattern dated 1954 commissioned to celebrate the centenary of Smedley Brothers Ltd, Eagle Iron Works Belper in 1955. Tudor Tray commissioned by Hunters, the Derby furniture store, and dated 1955. Tudor tray marked with the crest of Chesterfield Borough Council motto "Aspire" It is noted that the Armorial bearings were granted to the borough corporation (which I understand preceded the present borough council) in 1955, but unfortunately the tray is undated. Surrey Shape tea cup and saucer, boxed gadroon tray and alton tray produced to celebrate the Moravian Church 500th Anniversary. The cup and saucer are dated 1957 although the factory mark on the gadroon tray is three years earlier in 1954. Tudor Tray in the Posie pattern produced in 1957 to celebrate the centenary of Bright and Sons Ltd. The Jewellers, Scarborough. It was sold in a box with the inscription repeated in gold print around the edge. In 1957 the Derby Corporation presented the Queen with a service in the Royal Pinxton Roses Pattern consisting of 120 pieces. Two trays showing images of the Chichester Festival Theatre and dated 1957. These are part of a substantial "job lot" sold in 2015 through Derby Auctioneers, Bamfords, and it would appear from the Festival Theatre website archive photographs that the original design was significantly revised before the project was completed in 1962. As a result these would have become obsolete. Unidentified plate and saucer with monogram FOC. The saucer is dated 1960. If anyone knows any more information please get in touch through the contact page. The earliest piece of ware that I have found produced specifically for the catering trade. Inscribed the Falcon Hotel, Stratford it is dated 1961 and is made with heavy duty in mind, as is ungilt and rather thickly set to withstand frequent use. This was acquired from the USA where I have also seen a crescent salad dish for sale. Part of a service in A1066 pattern made for Birkenhead Borough Council C1962 with crest and motto "Ubi Fides Ibi Lux et Robur" It merged with the county borough of Wallasey together with the municipal borough of Bebington and the urban districts of Hoylake and Wirral to form the Metropolitan Borough of Wirral on the 1st April 1974. Miscellaneous monogrammed ware all unfortunately undated. The tea pot has the war time factory mark and may have been part of a boxed set. Second World War Memorabilia produced with regimental badges. So far I have only come across Ashtrays and Cigarette Boxes which were no doubt sold as smokers sets. The Royal Air Force oblong tray in blue enamel is part of the Dale Marchant Collection and the image is reproduced courtesy of Dale Marchant. If you have any other examples you would like to be included do get in touch using the contact page.